The pickup trucks are now designed to suit all kind of needs. In the first place they deliver proper working capabilities which is their main purpose but more passenger friendly versions are also available with luxury appointed cabins and fitted with modern electronics. However, those who need more off-road oriented versions which are capable to deliver towing and hauling abilities on rough terrains will probably have Ford’s Raptor or Chevy’s Silverado that is equipped with Z71 package as their first associations. However, the Ram has also to offer the Ram Rebel from 1500 series but even more capable version that is based on Ram’s 2500 HD Crew Cab model will be available soon. This off-road ready version was presented at the last Chicago Auto Show and will go on sale known as 2017 Ram Power Wagon. What this model brings is brawny, smaller Rebel inspired design; well-designed interior and what is most important exclusive off-road hardware beefed to enable hauling in the most rugged trains. The engine will be familiar Hemi V-8 coupled with proven six-speed transmission and four-wheel drive. 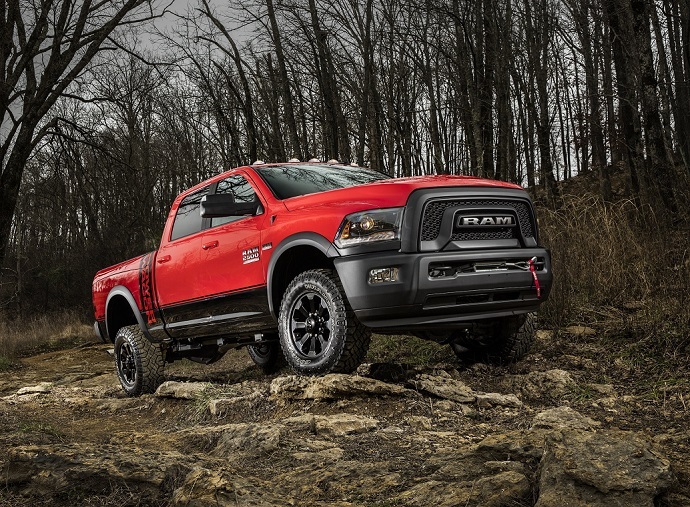 In the engine department, the new 2017 Ram Power Wagon will fit a large and capable 6.4 liter V-8 HEMI engine. The engine develops 410 HP at 5,600 rpm and torque of 429 pound-feet at 4,000 rpm. In order to control fuel consumption this engine exploits cylinder deactivation and variable valve timing. The power from the engine is routed trough heavy-duty 66RFE six-speed automated shifter to part-time BorgWarner transfer case which is manually controlled. Four wheel drive is mandatory and it comes with hill descant control. The 4WD system while in Low driving mode features softened throttle response and while crawling the engine responses with idle speed that is increased from 650 rpm to 750 rpm. The other hardware is also solid and designed to handle heavy-duty strains. The axles come from American Axle Manufacturing and they are robust with the front axle that measures 9.25 inches while the rear unit 11.5 inches. Bigger are also rear axle’s shafts which are 38 mm. What is also important, both axles are with electronically controlled locking differentials and like on the all HD Ram model when they are not needed the front axles are automatically unlocked which increases system’s efficiency. Under the body of this model sits fully boxed steel frame and it also uses special suspension setup. Up front is three link layout which also includes unique control arms and there are also specific spring rates and Blistein shocks. The rear suspension is the same as on the other HD versions with five-link coil springs. The model also sports 14.3 inches of ground clearance which allows it to attack very rugged terrains. An approach angle is 34 degree, departure angle 26 degree and it features break over angle of 24 degree. As company claims the Power Wagon model is capable of fording 30 inches deep water. As for payload and tow capacity this Ram will allow up to 1, 510 pounds of payload capacity and towing capability is rated at 10,300 pounds. When it comes to its design, the new 2017 Ram Power Wagon features unmistakable Ram’s identity. Its styling is inspired with both “Macho Power Wagon” from 1979-80 and with the recent Ram Rebel. The most obvious feature on the exterior of the new Power Wagon is large front grille which has the same treatment as on the Rebel model. Below is the bumper which hides Warn winch that can pull up to 12, 000 pounds with 125 feet long steel cable. Both bumpers are also treated with powder coat. The model also includes a graphic treatment which was popular back in 1970s and vertical Power Wagon logo is applied on the cargo bed sides just behind the rear doors. Even bigger logo is seen on the tailgate between taillights that are surrounded by black bezels. The hood also features gloss-black graphic which in case of black painted version is bright silver. Another body color options for this model include Bright White, Bright Silver, Flame Red, Granite Crystal and Blue Streak. The unique for this model will also be 17-inch aluminum alloy wheels with black finish which are wrapped with 33-inch off-road tires. Interior side design is mostly the same as on the current 2016 Rams and it is available in two flavors. So called “technical grain” seats are standard and they are patterned with Goodyear Wrangler DuraTrac tire-tread design and finished with black and gray fabric inserts. The heated seats are available as option and they are accentuated with Power Wagon and Ram logos and also with Light Slate Gray stitching. With premium trim, the seats comes with leather upholstery and other assortment of logos. Both trims include leather-wrapped steering wheel with heated option. A dashboard design is unchanged and door panels and center stack are trimmed with Iron Gray Metallic paint while air vents bezels are finished satin chrome. The models also include 8.4 inch based UConnect system with navigation and 7-inch gauge cluster display. The model can be also be opted with options like LED bed lighting, a spray in bedliner, remote start, power adjustable pedals, bed-view cameras, rearview camera, front and rear parking assist, etc. What also can be handy, this model is available with alternator system which comprises two separate outputs including 150 and 220-amp units. Matched with the Ram Rebel, the new 2017 Ram Power Wagon is sign that this brand continues to follow the lending truck companies and a wants to stay competitive as much as possible. The Ram dealerships will offer this model to the buyers in the last quarter of the current year. The price for this off-road oriented model hasn’t been specified yet.